UNION, S.C. (August 10, 2018): Trevor Eman and the Aruba.com team just took delivery of a new Jerry Haas-built 2018 Mustang. This will be the first major update for the team since they debuted their 2011 Mustang seven years ago. The new Mustang will be equipped with their tried and true Jon Kaase Ford power. 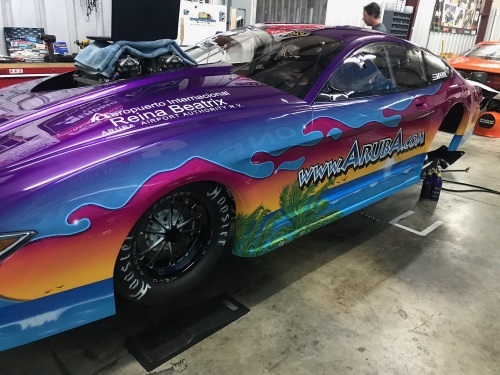 The Aruba.com Team has historically had some of the most eye-catching rides in drag racing and this Mustang is no different. It personifies the Emans’ island paradise home with vibrant colors depicting deep blue waters with palm trees set against a sunset backdrop. The car serves as a rolling billboard for a dream vacation. The Aruba.com Team plans to head to Union County Raceway to make the Mustang’s first passes this weekend. The first event will be the PDRA Drag Wars at GALOT Motorsports Park, September 6-8. Follow Team Aruba on Facebook and Twitter. Find race results, team updates, videos and photos. Also leave your comments to cheer on Team Aruba! For more on your Aruba vacation visit www.Aruba.com and www.airportaruba.com.